I feel as if i’ve done NOTHING today…. and honestly, it’s not far from true. aside from getting up a few dozen times to let the dogs in and out the back door here at my lovely friend Anna’s house, I’ve pretty much been on the sofa all day. I felt REALLY unmotivated today. and i’ve found myself hooked on a hulu show called misfits… thanks alot Anna… hehehe. Actually, it’s quite good. im not gonna give anything away but it’s about a group of young adults who are all doing community service and a freak storm gives them all superpowers. it’s a little dark at times, and definitely not for the easily offended but it’s really well written and im already halfway through the second season! I know, i know!~ i’ve been a terrible nomad over the past couple days, but hey everybody needs a break every now and again. besides, i could argue that ive been working all day…. 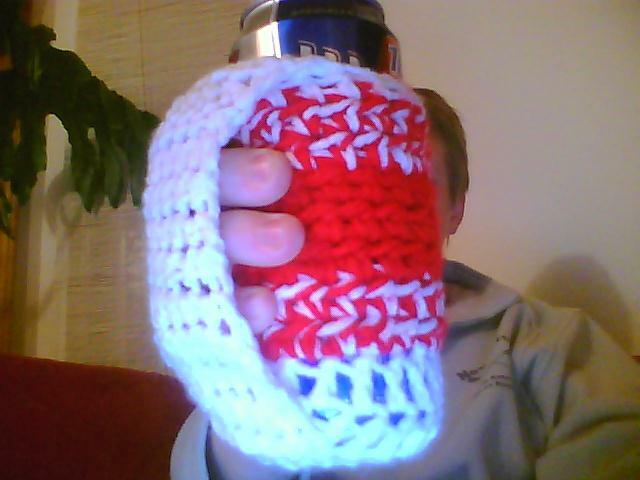 i’ve been crocheting while watching the show, had an order of BeerMuffs* to get done for a friend before christmas. *Beer Muffs are a coozie with a mitten attached to keep your hand warm. i decided to create them a few years ago, a coworker had crocheted a coozie and i liked it so i started making and selling them. on a cold day i decided to start addling the little sleeve to it to keep my fingers warm. since then i’ve sold probably upwards of 60 or so in different sizes, i make them for cans and 12oz bottles, bigger ones for 22ouncers and of course i also make them for 40’s! sometimes i even add a little pocket to hold a cell phone, cigarettes, or whatever other vice you partake of while drinking. i’m gonna make a pile of them and carry them around when i go out once this custom batch is done… everyone can use a little extra cash every now and again… actually when i lived in Boise a few years back heather and i were at a bar using ours, i gave one to the bartender as part of a tip, and also ended up selling a set of 10 custom muffs to a guys for his friend’s new bar they were buidling. i used to call them cozy coozies… but i find beermuff more fun to say! i’m excited!! a good number of my fellow guides have these and have let me try them out… each one is drastically different in feel, i cant wait to use mine! i actually do need it too, it’s not just because i want it… the very last day of my commercial season this year, the last trip of the year my company ran on the Gauley in fact, i broke my guidestick. so it really is time. i mean, sure i can fix my other one… and i will… but it’s time. this is more than a summer job to me. beyond that… i did a whole lot of sitting around…. click the link above to read the first 3 chapters, be sure to leave feedback, she will appreciate it! you know, i never knew that getting a book published was so involved… for anyone who thinks like i did that how it works is: the publisher likes your book, sends it through editing for grammar and syntax then starts printing… you, like me, are mistaken… just because they like your book doesnt mean you wont be doing rewrites for months… there is in fact a reason for the higer costs of some books… makes far more sense now why they charge so much for nonfiction (and texts)… not only do they have to go through all that, they also have to check all of the facts! it’s really involved!! hmm… anything else to add right now…??? meh…. im sleepy, time to crash. please, if theres anything you’d like to know about me, ask! some direction for my babbling may not be a bad thing. I think it’s great that you got creative with the Beer Muffs (and that is more fun to say than coozie). Pockets are handy and I don’t think I’ve ever seen any with those. That’s cool you’re getting a custom paddle. Yes publishing can be a long process, and that’s not even counting the time it takes to write and revise (and re-revise) before it’s even sent anywhere. the pocket is actually a sleeve to keep your hand warm! but it certainly doubles as a phone (or whatever) holder! i am really stoked for the paddle! got word today that my deposit arrived and it will be in the works shortly! !